Make yourself at home in one of the 126 guestrooms. Complimentary wireless Internet access keeps you connected, and satellite programming is available for your entertainment. Bathrooms have showers and hair dryers. Housekeeping is provided daily, and cribs/infant beds (complimentary) can be requested. This charming establishment is situated in Golden Sands, a major seaside resort town located on the northern Bulgarian Black Sea Coast. It features a prime position just 200 metres from the beach and about 500 metres from the resort centre. The vibrant city of Varna is to be found some 18 kilometres from this hotel and Varna Airport is 25 kilometres away. Ideal to spend unforgettable moments with the family or to enjoy a romantic getaway, the property offers different room types to meet all visitors’ expectations. They range from single rooms to completely equipped apartments with a spacious sitting area and complimentary Wi-Fi internet connection. The onsite restaurant offers breakfast, lunch and dinner, as well as delicious specialities of traditional Bulgarian and European cuisines. Facilities also include a children’s playground designed with younger guests’ needs in mind. With a stay at Benvita in Varna, you'll be within a 10-minute drive of Golden Sands Beach and Cabacum Beach. This hotel is 7.6 mi (12.2 km) from Sea Garden and 1.7 mi (2.7 km) from Sunny Day Beach. Make yourself at home in one of the 232 air-conditioned rooms featuring kitchens with refrigerators and stovetops. Rooms have private furnished balconies. Flat-screen televisions with satellite programming provide entertainment, while complimentary wireless Internet access keeps you connected. Housekeeping is provided daily, and microwaves can be requested. With a stay at Aqua View in Varna, you'll be within a 15-minute drive of Golden Sands Beach and Cabacum Beach. This hotel is 7 mi (11.2 km) from Sea Garden and 1 mi (1.6 km) from Sunny Day Beach. Ideal for nature and beach lovers, this hotel features a quiet situation in a forest, just a few steps from the coast. It is situated in the vibrant resort of Golden Sands, a place transformed into a modern holiday complex with numerous restaurants, clubs, casinos and sports facilities. Designed with guests' needs in mind, the property offers a large choice of double rooms and apartments that have been fully-equipped with modern conveniences such as satellite TV. Most of the rooms also include Wi-Fi internet access in extra charge. Those travellers staying at this hotel for business purposes may take advantage of the conference room for up to 140 attendees. There is also a large outdoor pool with separate children's area. The hotel also has a unique rooftop pool for an extra charge. Make yourself at home in one of the 110 air-conditioned rooms featuring kitchenettes. Rooms have private balconies or patios. Complimentary wireless Internet access keeps you connected, and cable programming is available for your entertainment. Conveniences include safes and desks, and housekeeping is provided on a limited basis. Enjoy a range of recreational amenities, including an outdoor pool, an outdoor tennis court, and a sauna. Additional amenities at this aparthotel include wireless Internet access (surcharge), a hair salon, and shopping on site. Guests can catch a ride to nearby destinations on the area shuttle (surcharge). Make yourself at home in one of the 247 air-conditioned rooms featuring refrigerators and minibars. Rooms have private balconies or patios. Wireless Internet access (surcharge) keeps you connected, and cable programming is available for your entertainment. Private bathrooms with shower/tub combinations feature complimentary toiletries and hair dryers. 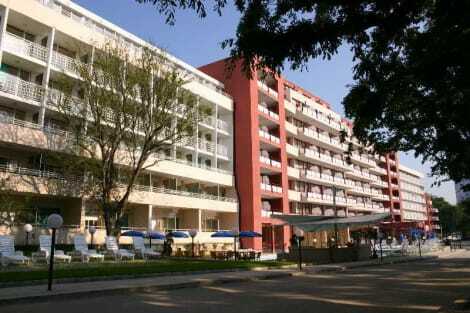 Prestige Deluxe Hotel Aquapark Club” is a 4-star family hotel, situated in the heart of Golden Sands, only 350m. away from the center alley and the beach, in quiet area among naturally green park. The fully renovated hotel offers Deluxe suites and Double Deluxe rooms, Aquapark with water slides for adults and children and Children Fun center „Gymboree” where the kids will enjoy a lot of games and fun. The hotel is located in first row of the resort of Golden Sands, only 60 metres from the sandy beach and 100 metres from the resort centre. The closest bus station is about 500 metres away. 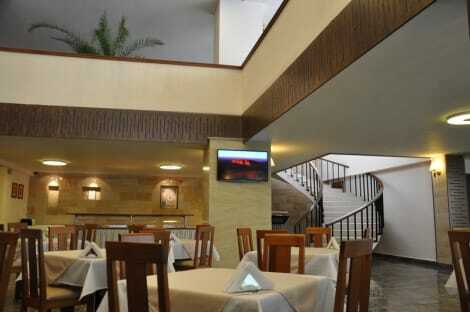 The hotel is approximately 20 km from the next big city of Varna and 30 km from Varna Airport. The beach hotel is a 6-storey building with 2 lifts and consists of 100 rooms. The premises are air-conditioned and guests are welcomed in a lobby. 24-hour reception and check-out services are available and there are safe boxes at the reception. There is lift access to the upper floors. Guests can dine at a restaurant and bar, and room service is on offer. An Internet café, shop, currency exchange, laundry, doctor services, luggage room, parking and car rental are also at their disposal. All standard rooms have an en suite bathroom with a shower and a WC. Rooms are furnished with double beds. They also have a balcony, central air conditioning and heating, a direct dial phone and satellite television. The minibar can be used for an extra charge. The family room has 2 standard rooms with a connecting door. The sun beds and sun umbrellas on the sun terrace by the outdoor swimming pool and on the beach can be used and incur extra costs. There is also a children's swimming area and refreshments are available from the poolside snack bar. The gym can be used for an extra charge and guests can pamper themselves with a massage treatment during their stay. At the sandy beach guests can choose from a number of activities including waterskiing, jet skiing, diving, motor boating, banana boating and beach volleyball (all activities incur additional fees). Tennis courts are also available (fees apply). 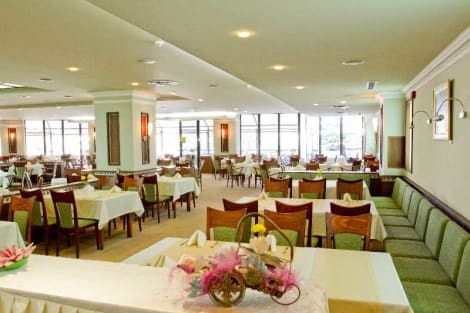 There are breakfast and dinner buffets, which guests can enjoy in the hotel's restaurant. lastminute.com has a fantastic range of hotels in Golden Sands, with everything from cheap hotels to luxurious five star accommodation available. We like to live up to our last minute name so remember you can book any one of our excellent Golden Sands hotels up until midnight and stay the same night.